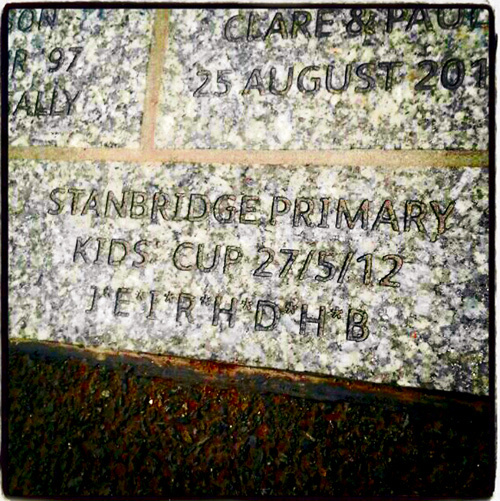 THE achievement of a team of talented young footballers from Downend has been captured in stone on Wembley Way. A team from Stanbridge Primary School won the npower Football League Kids’ Cup by defeating a side from Macclesfield in a penalty shoot-out at Wembley Stadium last summer. Their achievement has now been recognised with a stone that has been laid on Wembley Way near the Bobby Moore statue. Gary Sloper, co-manager of the winning team, was a Football Association guest at the recent England vs Brazil game at Wembley to mark the event. The side were unbeaten in 19 matches on their run to the final, which was watched by parents and teachers who travelled to the capital to cheer on the youngsters aged between nine and 11. The final was played before the League Two play-off final between Cheltenham and Crewe, and hundreds of supporters were filling the stadium as the Stanbridge stars took to the hallowed turf. The team, who represented Bristol Rovers in the competition, was coached by teacher James Baker and parent Mr Sloper.